WASHINGTON, D.C. -- While the U.S. 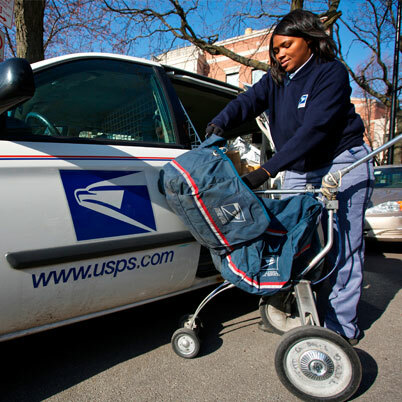 Postal Service has recently withstood a barrage of negative attention, from getting hacked to announcing continued multibillion-dollar deficits, it enjoys the most positive image of 13 high-profile government agencies Gallup recently tested. Younger Americans are more likely than older Americans to review the Postal Service favorably. The Postal Service is the nation's second-largest employer, and an agency virtually all Americans interact with to some extent in their daily lives. Younger Americans, who may have accumulated less experience with the service, have a very positive image of the job it is doing. All age groups give solid approval ratings to the Postal Service -- however, their ratings decline from 81% among the youngest age group to 65% among the oldest. Seniors' ratings of the Postal Service, however, still exceed the ratings they give to all other federal government agencies tested in the Nov. 11-12 survey. 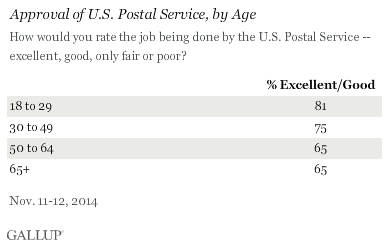 Overall, 73% of women and 70% of men in the U.S. rate the job the Postal Service is doing as "excellent" or "good." Additionally, although Gallup documents clear generational differences in the Postal Service's image, men and women within each age group give the agency similar ratings. Among those under 50 years of age, 80% of women and 75% of men give it positive reviews. 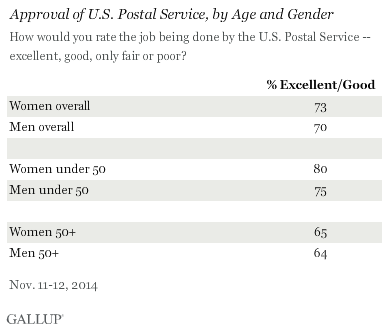 And there is virtually no difference in men's and women's views of the Postal Service among those 50 and older, with just under two-thirds of each group rating it favorably. Discovering that Americans rate the U.S. Postal Service ahead of 12 other major government agencies could be good news for an organization that has been battered by bad publicity for quite some time. Americans are probably more likely, to some degree, to come into direct contact with the Postal Service and the IRS than with any of the other agencies tested -- and clearly that experience has resulted in a very positive image for the service, compared with Americans' negative image of the IRS. While the post office has been forced to address concerns over competitiveness and budget woes by consolidating installations, limiting Saturday delivery and increasing revenue through raising stamp prices, the overall image of the agency has remained remarkably positive. This reservoir of goodwill may serve the Postal Service well as it strives to adapt to the changing world in which electronic communication and commerce are rapidly replacing the traditional mailed letter. While more than six in 10 Americans overall back cost-cutting measures, less than a majority of the youngest age group say they support eliminating Saturday delivery. Perhaps not surprisingly, this youngest segment has the highest approval rating of the Postal Service. One might expect older Americans to be the age group viewing the service most favorably, at least out of nostalgia. The fact that the opposite is true could mean that the agency has the opportunity to establish itself as a trusted brand with this new generation, putting the baggage of any tarnished image with older Americans behind them. A possible explanation for reconciling these opinions may be the difference in how these age groups interact with the post office. 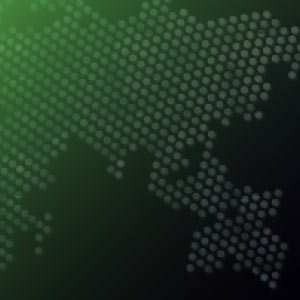 A recent Gallup report shows that 18- to 49-year-olds are nearly universal in their reporting of Internet usage on a day-to-day basis, while over a third of older Americans report not using the Internet. Thus, it is also possible that while younger Americans may be mailing and receiving fewer traditional letters, they could be more connected to the Postal Service as a result of e-commerce and receiving goods purchased online. Older Americans are more likely to consume Postal Service goods and services in person and to receive more hard copy mail such as bills and cards. Receiving packages purchased online may be a more positive customer experience than performing interactions in person at postal locations -- thus providing a reason why younger Americans have a more positive view of the Postal Service. In fact, from the standpoint of the recipient, the Postal Service may be making even more package deliveries than customers expect, as it will frequently deliver millions of packages for UPS and FedEx in their "last mile," thereby increasing these touchpoints and reinforcing these ratings over time. With the country becoming more reliant on the Internet and rapidly embracing e-commerce, the increased amount of shipping and packaging could prove even more beneficial for the Postal Service both in its image ratings and financial performance. If the way in which Americans consume the agency's services affects its image, future ratings could trend upward as the market shifts. And the Postal Service has actually seen significant growth and profitability in its shipping and packaging business year over year. The agency's current leadership team has recognized this trend and opportunity and has even partnered with Amazon to deliver packages on Sundays. In the meantime, the Postal Service could benefit from learning more about how to further convert these positive feelings into increased share of wallet and customer retention among the younger segment of the population, and from determining how to optimize the interactions that may impact older Americans' perceptions. Americans' ratings of the job the Centers for Disease Control, or CDC, is doing are down significantly from last year, whereas ratings of other key government agencies measured both years are the same or better.